"A pair of Queen Victoria's bloomers, with a 50-inch waist, were snapped up for $9,000 by a Canadian buyer at a central England auction Wednesday. "Auctioneer Charles Hanson said Queen Victoria's underpants belonged to 'a very big lady of quite small stature with a very wide girth.' She was said to be 5 feet (1.52 meters) tall. The handmade cotton knickers, which date to the 1890s, bear the monogram 'VR' for Victoria Regina. They are open-crotch style, with separate legs joined by a drawstring at the waist, a popular style in the late Victorian era. "The royal drawers belonged to a family in western England whose ancestor was a lady-in-waiting for the queen. "Also up for auction was Queen Victoria's chemise, with a 66-inch bust, which sold for $8,000. Her nightgown sold for $11,000. "Before the auction, Hanson valued the underwear at $1,000, while the chemise and nightgown were valued at $600 each." The buyer, Barbara Rusch of Toronto, has collected Queen Victoria memorabilia of all kinds for about 25 years, but has never been able to bid on a pair of her bloomers before. "This is a wonderful, wonderful find for me today and a great acquisition, a great treasure to add to my collection," she said. Rusch also owns a pair of Queen Victoria's pink hand-embroidered stockings. Read the BBC story here, The Guardian story here, and The Telegraph story here. The Mail Online previewed the auction here. Shown here: Auction assistant Sam Rhodes models the royal bloomers. Casey Finch, "'Hooked and Buttoned Together'": Victorian Underwear and Representations of the Female Body," Victorian Studies, Spring 1991, pages 337-363. Leigh Summers, Bound to Please: A History of the Victorian Corset (Oxford: Berg, 2001). I hadn't realised actually how large Queen Vic must have been till I saw those bloomers! 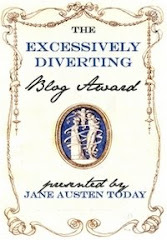 I found your blog through Technorati as I recently joined. I love the history of our country and my interest increased when I worked on compiling my family tree. 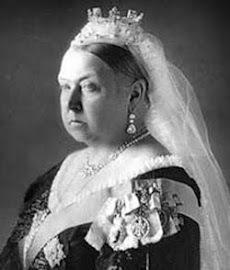 I have read a good deal about Queen Victoria and her family. I knew she was very short in stature but never realised how very big she was in other ways! Thank you for this interesting piece. Hi! I enjoy your blog a lot, I added it to my blogroll!